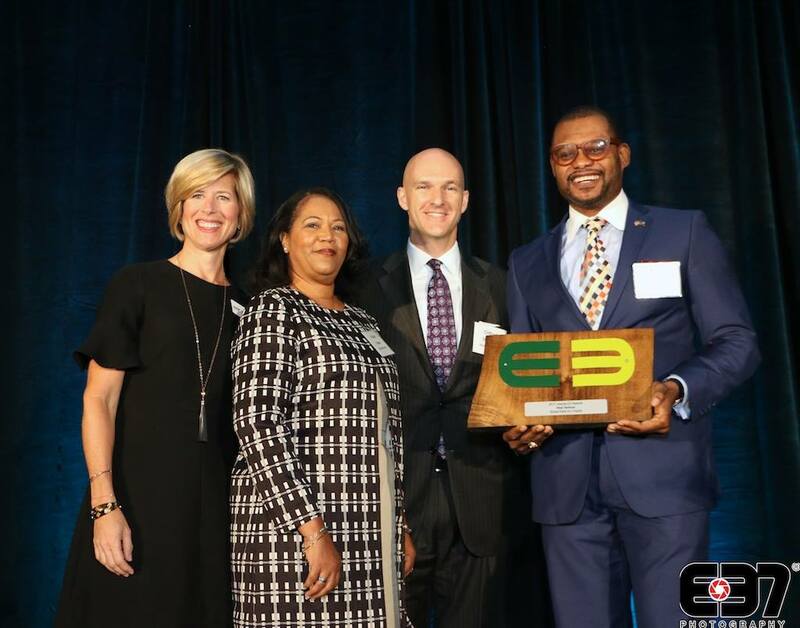 (Atlanta, October 5, 2017) - We are all honored, humbled and delighted to announce that the Global Paint projects (Known as “Global Paint for Charity or “Global Paint“ or “GPC“) has won the Metro Atlanta Chamber's 2017 E3 Award in the NEW VENTURE category for startup or new business that advances sustainability through environmental and sustainable business solutions. Here is a quick overview of the three finalists in the category, including Global Paint Founder and CEO, Rony Delgarde sharing the importance of recycling paint and use it as a resource to help the underserved communities throughout the world. The Global Paint project was created to give each person in developing countries and those in need in the United States, we serve the opportunity to enjoy the beauty of their shelter through every gallon of recycled paint. Through our efforts, we strive to protect the environment, change lives, beautify and transform underserved communities throughout the world. Currently, the organization serves 24 developing countries in the Caribbean, Central America, the Middle East and Africa and many major cities in the U.S. We are passionate about the youth here in the City and offer numerous volunteer opportunities in Atlanta areas. Every day many young people are inspired by the work they perform with our organization whether by volunteering to paint in our community or to work at our donation facility and storage. We have dozens of outdoor home painting projects throughout the city for the elderly senior residents that are physically and/or financially unable to paint the residence on their own. Also, the youth help us to paint murals, classrooms at public schools and parks in our communities. Last year, the juvenile offenders have completed 2930 hours of community service—this is amazing! We have collected more than 200,000 gallons of paint and redistributed more than 180,000 gallons to help with renovations and rejuvenation of family homes, homeless shelters, basic schools, churches, orphanages, and hospitals in third world countries and targeted communities in many major cities right here in the U.S. The Global Paint for Charity aims to reduce used paint from businesses and residential properties by 20% by the year 2020. Last year, we launched the "Basic Schools Beautification Programs in Africa” to paint approximately 8000 schools in 12 countries in West Africa by 2025. We are honored that our efforts are helping many underserved communities throughout the world. Many thanks to The Metro Atlanta Chamber for this outstanding award, also thanks to GPC Board of Directors, volunteers, donors and friends who have been actively supporting and promoting our humble cause. It’s estimated that 80 percent of the world’s homes and schools face the dreary reality of unpainted walls in underprivileged communities, and more than 70 million children have never had access to a painted classroom. Seeing the smiles on the faces of every person we help through our programs is a great joy for all of us---whether it is a millennial who needed to complete multiple hours of community service, or an elderly widow who needed assistance in face-lifting her property. Thank you for making this possible and for your unwavering commitment to the work ahead. With your help, we can brighten our world one gallon of paint at a time. Because we believe that the right color in homes or classrooms can truly change the atmosphere of their environment and even livelihoods. The Metro Atlanta Chamber (MAC) serves as a catalyst for a more prosperous and vibrant region. To advance economic growth and improve metro Atlanta’s quality of place, MAC is focused on starting, growing and recruiting companies to the 29-county metro Atlanta region. The Chamber is also focused on expanding the region’s innovation economy by promoting and strengthening connections to drive Atlanta’s innovation and entrepreneurial culture. MAC is committed to being an active voice for the business community, serving as an advocate for a competitive business climate and promoting Atlanta’s story. For more information, visit http://www.MetroAtlantaChamber.com.